Encants market is an initiative to accomodate all commercial activities and improve the mobility, the public transport system and the management of equipments in the area. 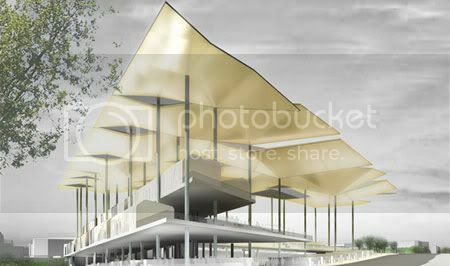 b720 Arquitectos has won the design of a new Encants market from the City Council of Barcelona. 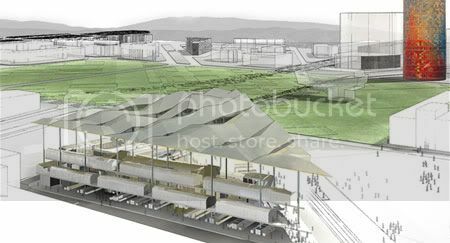 The new Fira of Bellcaire market, better known as Encants Vells of Barcelona, will be located in the zone of Bosquet and its transfer is one of the pieces that will facilitate the unfolding of the modify of the Metropolitan General Plan in the Glories area. 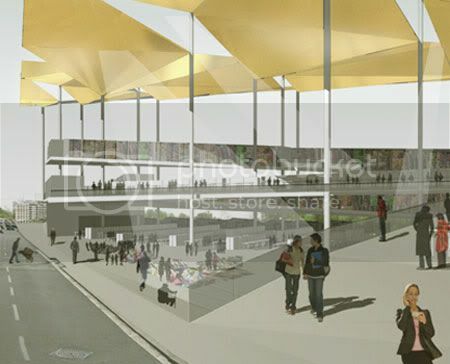 The new Encants market is installed as a device to mediate between the reform of the Glorias square and the axis of Meridiana, an area popularly known as the Glories of Bosquet. The b720 proposal raises a platform (or commercial square) at various levels as a continuous surface suitable for all commercial activities. By bending the platform, the different levels of the street are reconciled, understanding the market as a large square deck, capable of instilling activity in all parts of the program. The new facility, defined as “functional, open and future”, tries, from a structural point of view, for protecting the business of inclement weather under their deck, but always retaining a sense of buying outdoors. The commercial solution proposed (shops and auction) will be located primarily at the street level and will not be placed under any building other than its own deck, which will form an open commercial space with a main façade to the Meridiana avenue and the Glories square. The remaining business that has the market (formed by the other shops that are not at the street level) and the new supply and services that may have (restaurant, play centres, offices, multipurpose rooms…) would be located over this zero level while preserving the sense of buying street. The project includes an underground car park with capacity for about 300 cars, loading area, storage area, locker, offices and other auxiliary services. The cover, the principal component of urban recognition, protects commercial activities and reflects the city inside the market. Each modular structure will have different inclinations to reflect light, atmosphere and landscape.